I received this book via Netgalley. As always, this in no way affected my opinion of the book. As always, thank you to Netgalley and Abrams Kids for allowing me to read it. I thought it was a very interesting choice that the author started the book with dialogue as you don’t see that very often and her writing style overall throughout the book was really nice, there were some lovely passages of description in there that I really enjoyed. There were a few typos, but since it was a proof copy I was reading, that’s to be expected. There was a particularly great line of dialogue at the end, where Avi says, “She’s British, she’s freezing, of course she wants tea” which made me laugh so hard. The transitions between Curtis and Mila’s POV’s were a bit clumsy to start off with and this wasn’t helped by the fact that the chapters were quite short so as soon as you’d got into one of their POVs, it was the other ones turn. Still, the author created the sense of time very well in both, you could definitely tell they were from different time periods and the voices were distinct which is always a worry when reading multiple POV books. I didn’t really fall in love with either of the characters. I mean I found Mila’s chapters more interesting than Curtis’ because more of the paranormal elements were present in her chapters, but she still felt very bland to me, as did Curtis. Also their insta-love was entirely unrealistic to me, Curtis literally sees a picture of Mila and falls in love. Mila sees him in the mirror once and is having steamy dreams about him. I felt like I could root for Mila a lot more than I could root for Curtis though, she is trying to escape the house to get away from her abusive stepfather, whereas Curtis is just trying to find Gravenhearst to prove that she’s not crazy. Curtis’ friend Avi and his sister Sage seemed to be the only ones with any real personality and I wished we’d got a bit more of them. I would have liked to get a chance to get to know Wynn better, she seemed really sweet and we barely got a chance to get to know her before she disappeared. I wasn’t a fan of how the mental health aspects of this story were portrayed, Curtis’ father has some form of mental illness, the exact one is not named in the story. It felt like Curtis’ father’s mental illness was merely used as a plot device in order to explain Curtis’ fear at hearing voice and giving him a “tragic” backstory and that didn’t really sit well with me. I wasn’t a big fan of how Curtis dealt with his father’s mental illness, he’s not very understanding, he just gets angry. Also I didn’t like how the author used Curtis believed mental illness as a plot twist, that didn’t sit right with me either. The scenes portraying Curtis’ father’s mental illness can be quite violent and could be potentially triggering, so just a warning for that. It did find it weird since their mother died when they were so young and their dad had been ill for all that time that they hadn’t been taken into care, it didn’t seem realistic. The first half of the book was quite slow paced for me, it was only in the second half when Curtis and Mila’s POVs started to really come together when I became properly engaged with the story. I liked the Canadian setting, it’s so rare for me to read books set outside the US/UK (if it’s not a fantasy world), so it was nice to see a different setting. I did like the mystery with the house and how everything came together with Mila and Curtis’ storyline intermingling at the end, I thought that was really well done. Gravenhearst, the house that shifts through time was suitably creepy and you could tell why Mila was desperate to get out of there. Deemus was horrible, truly awful and totally deserved what he got. I would have liked a bit more information on how Gravenhearst worked though, you get vague details but I thought it could have been explained better. There was some LGBTQ rep with Curtis’s sister, and Mila’s father but it’s very much background and you only really hear about it second hand so I wouldn’t exactly count this as an LGBTQ book. This is a minor thing, but there’s a passage where Mila was reading out loud from a book and the passage from the book probably should have been italicised. There were some decent twists towards the end that I didn’t see coming, but the pace was so fast at the end as compared to the slow build up that you didn’t really have time take them in and there were certain things that confused me, although saying what would have been spoilery. I would have liked Zahra to have a bigger role during the story, given her role during the conclusion. I wasn’t really sure what the illustrations added to the book, but maybe that’s just me being not a particularly visual reader. The book ended sort of abruptly, it seems like the author is leaving the path open for a possible sequel, but perhaps not, I don’t know, it definitely wasn’t closed enough for a standalone though. 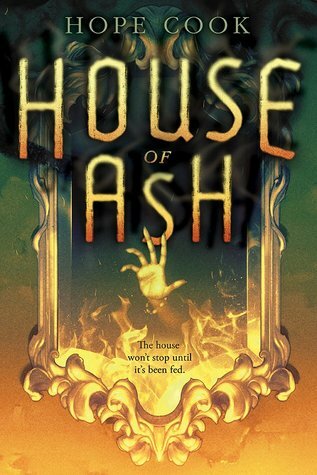 Overall this was a decent haunted house story, the writing was very pretty but the character development was a little lacking and the pace was very uneven, so it felt like the climax was rushed. My next review will be of the final book in the Magnus Chase trilogy, The Ship of The Dead. I’m not sure when it will be though as I’m only about halfway through now.